The Map Menu, showing the forces of all realms. 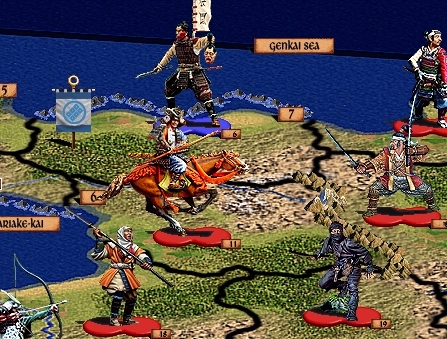 The map covers the 3 main Japanese isles, Honshu, Shikoku, and Kyushu, and the 20 most powerful daimyo of the era are depicted accurately in their regions. 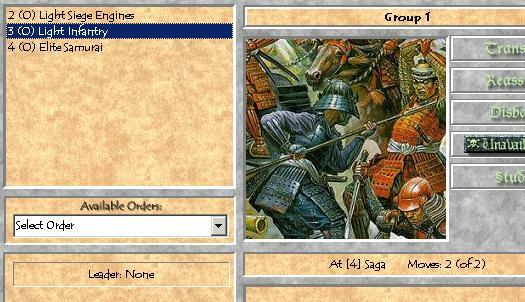 Examining Units: Each unit has various troops and/or ships. Land forces conquer and defend provinces, while ships rule the seas. 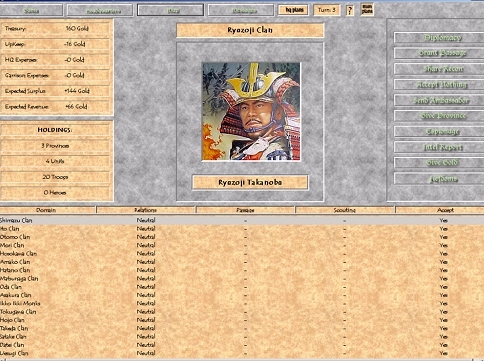 All troop-types and ship-types are authentic, and differ for each realm, from those of the Sohei warrior monks to bandits, Samurai and handgunners. Your Headquarters: You conduct diplomacy with other realms here, granting passage rights, declaring war, etc. Your neighbors will be other human players, each in control of a separate realm. You will need to conduct diplomacy with them in the same manner as a ruler in medieval Japan. Copyright Ancient Guardian Enterprises 2001-2004, All Rights Reserved.